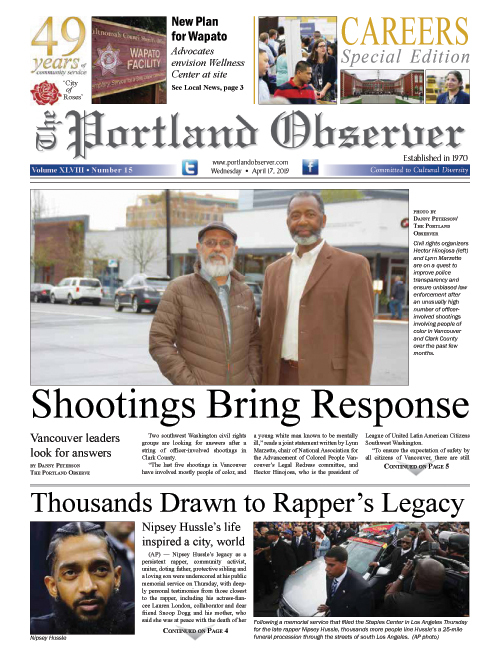 By Hazel Trice Edney/NNPA The Black Press | 4/11/2019, 1:21 p.m. The rapid expansion of legal sports betting nationwide hit a stumbling block in Oregon this month over concerns about the company chosen to manage the state’s sports betting program. The new development dealt a potentially significant blow to a rapidly growing segment of the gaming industry in America, which employs a strikingly high number of African-Americans and other racial and ethnic minority employees. Black and other workers of color, nationwide, make up 40 percent of the gambling industry’s workforce, per the American Gaming Association. Oregon is set to become one of the first Western states to offer legalized sports gambling, which state officials have said they hope to introduce by the start of the 2019 NFL season. Legal sports betting has become increasingly widespread following a US Supreme Court ruling last year allowing states to legalize the activity. But the state’s chosen gambling services contractor, SBTech, a European company that provides online gaming platforms in countries across the globe, is now under investigation. SBTech recently has drawn scrutiny over its relationships with gaming industry operators in Iran, which is under a broad range of economic sanctions from the Trump Administration. A new round of sanctions, which went into effect in early November, required all companies that operate in the US to cease business relationships in Iran. One of the losing bidders for the Oregon contract, SG Digital, has lodged a formal protest of SBTech’s bid that raised questions about the company’s character and fitness. Oregon Lottery Spokesman Matt Shelby told the Portland Observer Friday that its investigation of SBTech was a standard background check and not related to the claims of a competing vendor. Shelby said the Lottery had no reason to believe the company was operating in Iran or had any issues that would prevent its contract with the state moving forward. Oregon Lottery announced SBTech as its preferred vendor on March 22, and the company was slated to enter contract negotiations with the state. Fielding questions from commissioners on April 2, Farshad Allahdadi, chief gaming operations officer at the Oregon Lottery, said "final contract terms, duration and conditions are currently under negotiations." He added that the Oregon Lottery personnel will conduct a security and due diligence investigation. The Oregon state lottery has estimated that the state’s sports betting industry could generate up to $120 million annually if it reaches its full potential. Until last year, sports gambling was widely restricted in the US under the Professional and Amateur Sports Protection Act of 1992. Oregon was permitted to continue offering a limited form of gambling on NFL games that it offered prior to the law's passage. The state chose to discontinue the game in 2007 in an effort to recruit the NCAA to host tournament games in the state. Editor's note: This story was updated to include a clarification from Oregon Lottery that investigation was a standard background check and not related to the claims of a competing contractor, and a statement from SB Tech denying it had any business dealings with Iran.